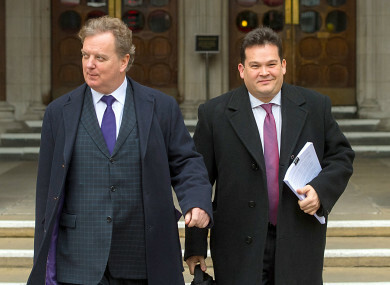 Peter Wilding, chairman of the pro-Europe pressure group British Influence (left) leaves the Royal Courts of Justice. THE WORD ‘BREXIT’ was first used in May 2010 during the eurozone crisis, when there was a real threat of Greece crashing out of the European Union. At the time, Greek Prime Minister Alexis Tsipras and his former finance minister Yanis Varoufakis were immersed in intensive talks with EU leaders about how to salvage the country from huge debt. If they couldn’t reach an agreement, Grexit was an almost inevitable outcome – and Peter Wilding thought that the UK was stumbling towards a something similar. It wasn’t until 2016 when representatives of the Oxford English Dictionary called him that he was told that the word had been traced back to him as the first person to use it. It was then made the dictionary’s word of the year. Wilding isn’t just another political pundit – he’s a former solicitor in EU law, former media director of the UK’s Conservative Party and former advisor to then-British Prime Minister David Cameron. Having coined the term gives him some claim to infamy, he says, but it also gives him a claim to what it actually means. So what does it mean to him? “It’s a grim word, but it could have been a unifying, positive word,” he says. Instead, Theresa May’s red lines have led to this stalemate in parliament, and “a catharsis” from government that have led to an extension, and could lead to a split of the Tory party. Does he regret coining the term ‘Brexit’? Did he look into it? As Cameron’s advisor during the EU referendum campaign, what does Wilding think the UK government did wrong when arguing in favour of Remain? “By that time, in 2012, I was getting to know that the British government had no strategy with regards to the EU,” Wilding says. Wilding is now the director of a pro-Europe pressure group ‘British Influence’, and has taken a legal challenge that argues that parliament must separately give permission before the British government can pull the UK out of the European Economic Area (which the UK is part of as a member of the EU). He said that underneath the euro crisis and the migrant crisis, an anti-EU sentiment was building, and unless Britain had a serious positive strategy in relation to it, it would backfire on them. When the EU referendum campaign had begun, Cameron had already won the Scottish Independence referendum in September 2014, which he had begun with quite a laid-back approach (the final result was 55% against Independence to 44.7% in favour). Independence would not be a trial separation, it would be a painful divorce… So this is our message to the people of Scotland: we want you to stay. Head, heart and soul we want you to stay. Please don’t mix up the temporary and the permanent. Please don’t think ‘I’m frustrated with politics right now, so I’ll walk out the door, and never come back’. Two years on, he would make the same mistake with the EU referendum – only this time, he didn’t salvage the government’s position at the last moment, Wilding says. “Bréalú”. “Éalú” is the Irish word for escape. The most commonly used one is Breatimeacht; ‘Sasamach’ implies only England is leaving the EU, and ‘Bréalú’ is too politically charged. But the word ‘Brexit’ itself – although a natural progression from ‘Grexit’ – it isn’t quite accurate either, as it implies only Britain is leaving the EU, ie, England and Wales. Or is it prophetic? Because Northern Ireland and Scotland voted to remain in the EU, will Brexit lead to the break-up of the UK? “I remember I was debating Ukip,” Wilding says, “who were foaming at the mouth about Brexit, and I said to them ‘Be careful what you wish for, that threatens the UK’, and they all dismissed it as ‘Project Fear’. But if this occurs as a bad Brexit, I think we’ll end up with a new Scottish referendum and a border poll in Northern Ireland. He says that MPs handling of Brexit has been revealed Westminster as “incompetent” and “arrogant”, drawing a comparison to The Emperor’s New Clothes. “If I was in Northern Ireland or Scotland, I would be looking on at Westminster and say that my loyalty and respect to the great mother of parliament has gone. Brexit could become a word like ‘Versailles’ – as shorthand for self-inflicted defeat. “This is a horrible crisis to be living though, but it is no different from other political crises that the UK has suffered,” Wilding says, citing ‘the Irish question’, or the Irish Home Rule movement, as one of those crises. After forecasting in January that there would be an extension, he’s predicting that the Tory party will lose a large number of seats in the local elections, that a new centrist party will emerge, and that we’ll get another extension by 31 October – ultimately leading to no Brexit at all. “What I expect to happen is what others don’t expect. We’ll be in a political meltdown. That is the conclusion of pollster Lord Hayward, who added the caveat that if May passes her deal before the elections, there will be a “a Brexit benefit” and “a clear deficit if not”. People can rally around a new political and cultural flagpole, and chronicle the death of foretold class-based parties no longer relevant to whether you’re open or closed in your mentality. In his 2012 column, Wilding wrote that “history has a habit of punishing drift”. Usually the people, demanding firm leadership, fail to get it and become beguiled by easy options. So, now that we have six months of Brexit breathing space, what is the UK’s easiest option? Email “Does the man who coined the word Brexit regret it? ‘I wouldn't have if I had copyrighted it’”. Feedback on “Does the man who coined the word Brexit regret it? ‘I wouldn't have if I had copyrighted it’”.